New science shows that technology that mimics what we do naturally and plays to our senses, like that of touching, will win us over in the user experience. Some are predicting that” the next generation of screens might not even need a touch. Instead, they will understand the gestures of people standing in front of them and pick up on eye movement and speech”. Are the users setting the trends for technology or the other way around? Whoever said technology was dehumanizing was wrong. On screens everywhere — cellphones, e-readers, A.T.M.’s — as Diana Ross sang, we just want to reach out and touch. The Sony Reader Touch Edition, to be introduced Wednesday. Researchers say people take naturally to touch screens. Scientists and academics who study how we interact with technology say people often try to import those behaviors into their lives, as anyone who has ever wished they could lower the volume on a loud conversation or Google their brain for an answer knows well. But they say touching screens has seeped into people’s day-to-day existence more quickly and completely than other technological behaviors because it is so natural, intimate and intuitive. And so device makers in a post-iPhone world are focused on fingertips, with touch at the core of the newest wave of computer design, known as natural user interface. Unlike past interfaces centered on the keyboard and mouse, natural user interface uses ingrained human movements that do not have to be learned. “It’s part of the general trajectory we’re on in the computing industry — this whole notion of making computers more open to natural human gestures and intentions,” said Eric Horvitz, distinguished scientist at Microsoft Research. The latest is a new line of Sony e-readers that the company will introduce Wednesday. 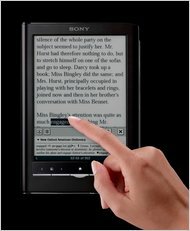 For the first time, all have touch screens; Sony decided on the technology after watching person after person in focus groups automatically swipe the screen of its older, nontouch e-readers. Research in Motion now makes touch-screen BlackBerrys, Amazon.com is expected to make a Kindle with a nonglare touch screen, and Garmin has introduced touch-screen GPS devices for biking, hiking and driving. New Canon and Panasonic digital cameras have touch screens and Diebold, which makes A.T.M.’s, says that more than half the machines that banks order today have touch screens. Brides-to-be can scroll through bridesmaid dresses on a Hewlett-Packard touch-screen computer at Priscilla of Boston bridal boutiques, and a liquor store in Houston uses the H.P. screen as a virtual bartender, giving customers instructions for mixing drinks. The screens also show up on exercise machines, in hospitals, at airport check-in terminals and on Virgin America airplanes. Next Next post: Social Media Marketing to Baby Boomers… Don’t Sleep on Their Influence and Power!